As I have observed previously, Thailand and Singapore have a defense relationship that includes not only traditional aspects like exchanges, visits, and exercises, but also components such as an overseas training area for Singapore in Thailand, one of several arrangements that the land scarce city-state has with partners including the United States and Australia. The two countries are also involved in broader multilateral interaction including those within the ASEAN framework as well as the Cobra Gold exercises, which Thailand hosts annually along with the United States. The development of the defense relationship has continued on into 2018 as well amid wider domestic and regional changes, with Singapore chairing ASEAN this year and transitioning the role onto Thailand for 2019, and both countries also undergoing domestic political changes with Thailand gearing up for expected elections next year and Singapore gradually transitioning to a period beyond current Prime Minister Lee Hsien Loong (See: “Thailand’s ASEAN Chair Challenge in 2019”). Indeed, defense interactions have continued on over the past few weeks, such as the introductory visit of Thailand’s chief of defense forces, General Ponpipaat Benyasri, to Singapore in mid-November. 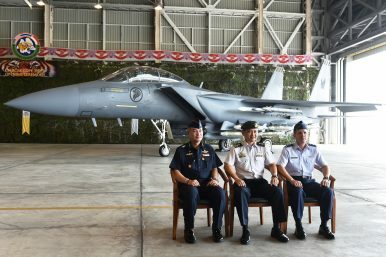 Last week, the defense relationship was in the headlines again with the visit of Thailand’s air force chief to Singapore. Commander-in-Chief of the Royal Thai Air Force (RTAF) Air Chief Marshal Chaiyapruk Didyasarin paid his introductory visit to Singapore from December 18 to December 20. Chaiyapruk’s visit included a series of interactions, including meetings with top Singapore defense officials such as Singapore’s Defense Minister Ng Eng Hen, Chief of Defense Force Melvyn Ong, and Chief of Air Force Mervyn Tan. According to Singapore’s defense ministry, during the meeting between Ng and Chaiyapruk, the two sides discussed both the state of their defense relationship as well as wider regional security issues, to include developments in Southeast Asia. In addition, Chaiyapruk also visited several defense facilities and interactions during his visit. He paid a visit to the Republic of Singapore Air Force (RSAF)’s Air Power Generation Command at Tengah Air Base, where he received a brief on the RSAF and viewed a demonstration of the counter Unmanned Aerial Systems operations. He also co-officiated the opening ceremony of Exercise Cope Tiger, an annual trilateral exercise conducted by the air forces of Singapore, Thailand and the United States. Johm Rungswang meets defense officials and oversees the opening of a trilateral air exercise with the United States.